After all of the cooking ahead that I did over the weekend, it was time to find room for it in the freezer. Most of the time, it's just a matter of moving a few things that hadn't been put away correctly to free up some extra space. This time, I just couldn't manage to fit everything back in. Don't get me wrong, I'm not complaining! It's comforting to know that the freezer is full! Based on the menu plan for the week, there wasn't really much that I could take out to make room. I really hated the thought of wasting anything, but mashed bananas seemed to be the best option if I had to toss something. Still, I didn't want to waste them. I considered making banana bread, but I didn't like the way it turned out that last few times I made it. I really have no patience when it comes to baking. Then I remembered seeing a 3-Ingredient Banana Bread recipe on Pinterest. When I went back to look for the recipe, the link didn't work. Sigh. I hate when that happens. After some further digging, I found what I was looking for...a recipe using cake mix, eggs and mashed bananas. 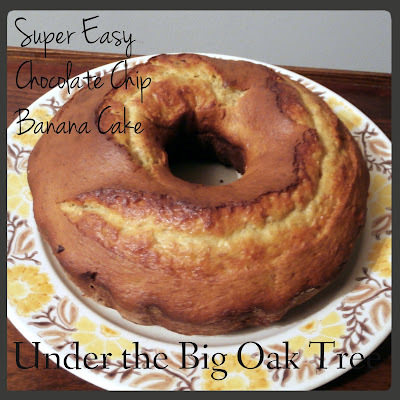 Once the bananas thawed, it was so easy to whip this cake together! I added chocolate chips as suggested as an optional add-in ingredient and also opted to use a bundt pan in place of the loaf pans. Grease bundt pan with butter and lightly coat with flour. Place mashed banana into a mixing bowl, add in cake mix. With an electric hand mixer, mix until well combined. Add in the eggs, mix well. Coat chocolate chips lightly with flour (this will help keep the chips from sinking to the bottom of the cake) then fold into the cake batter. Pour batter into bundt pan and bake 35-40 minutes, until cake tests done. I will definitely double the amount of chocolate chips the next time I make this...and yes, there will be a next time! The cake turned out both delicious and beautiful! I frosted the top with some chocolate frosting from a tub as well, since I was in the mood for something really chocolatey! 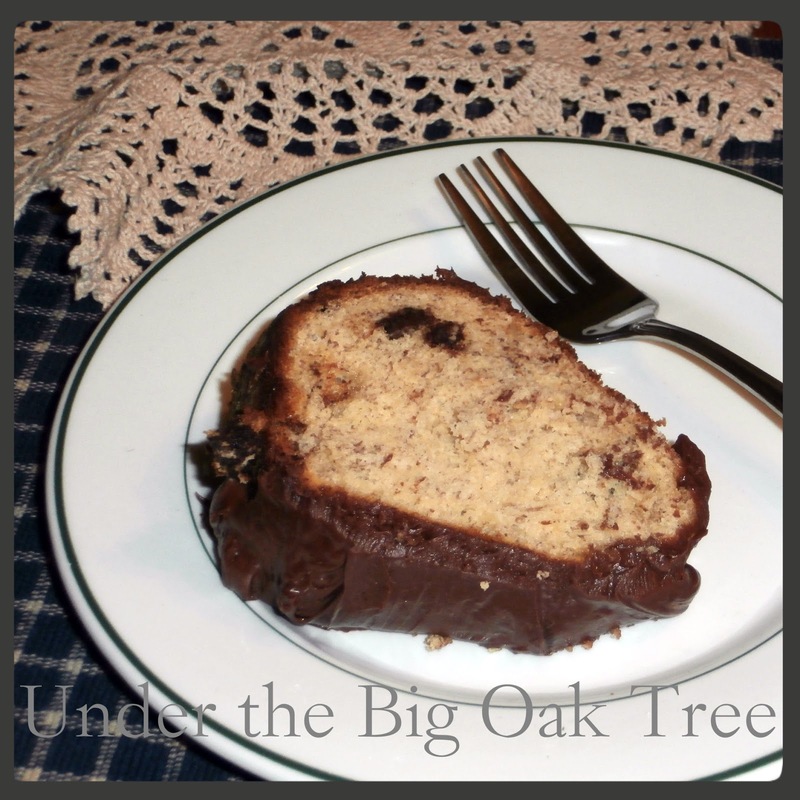 This cake is a wonderful way to use up all of those mashed bananas that I store in the freezer since I can't seem to use them quick enough during the colder months when it's too cold for frozen smoothies.